So next Monday we’re starting our 200 points kill team games during our lunch breaks at work. 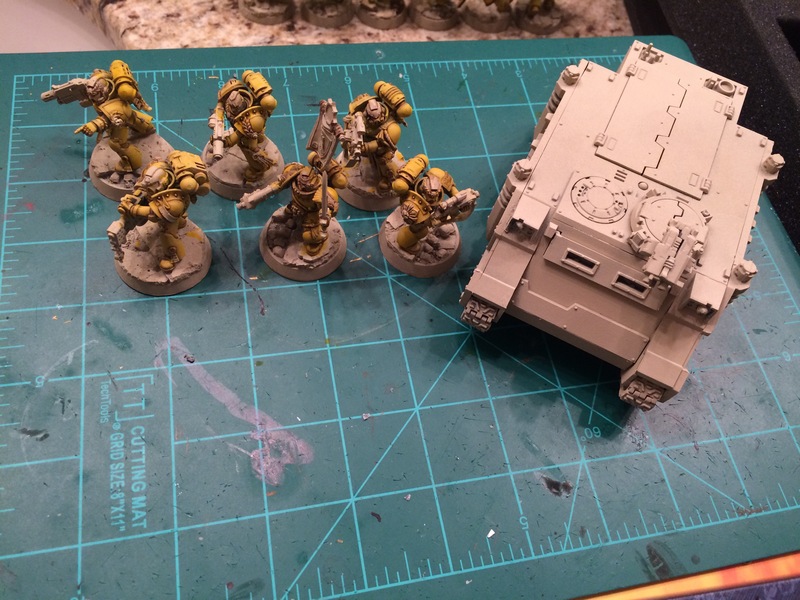 I’ve put together a six man Sternguard Veteran squad, with bolters and a heavy flamer, mounted in a rhino with two storm bolters. I haven’t had a lot of time to paint this week, so I’m trying to get them done during off periods at work, and late at night when my daughter is asleep. I’ve found a decent method to get great looking results in almost no time at all! I’m a professional art instructor for my day job, so while I would love to have a masterfully painted army of miniatures, the reality is that I want a good looking group of tabletop standard miniatures that will allow me to enjoy my hobby time to its fullest capacity. I figure I can always revisit the miniatures as time goes on to perfect them! I digress. 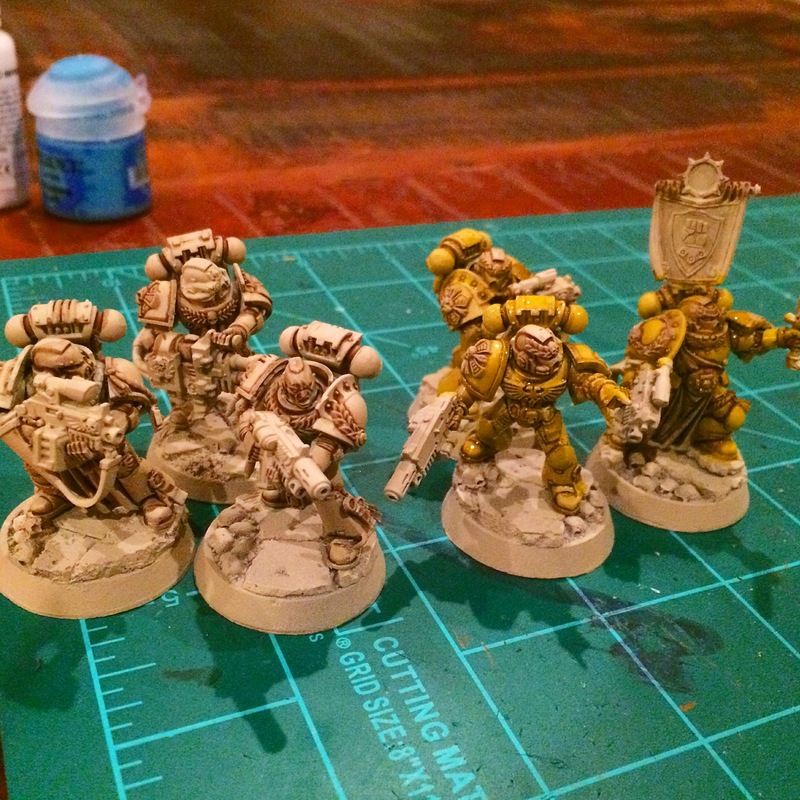 So far I have built all the models, primed them bone white, shaded the recessed areas with Agrax, and glazed each of them with the Lamenters Yellow glaze. I’ll detail the process later in the post. 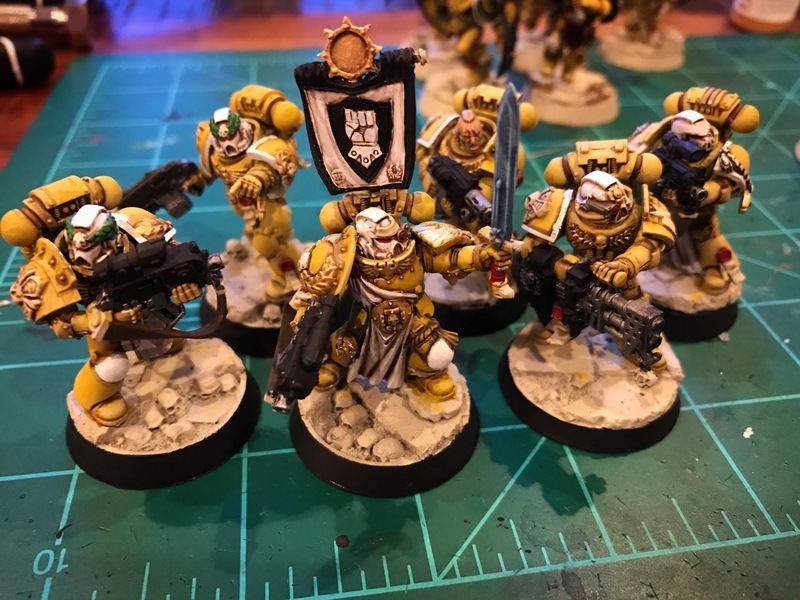 Sternguard veteran squad all built-up. 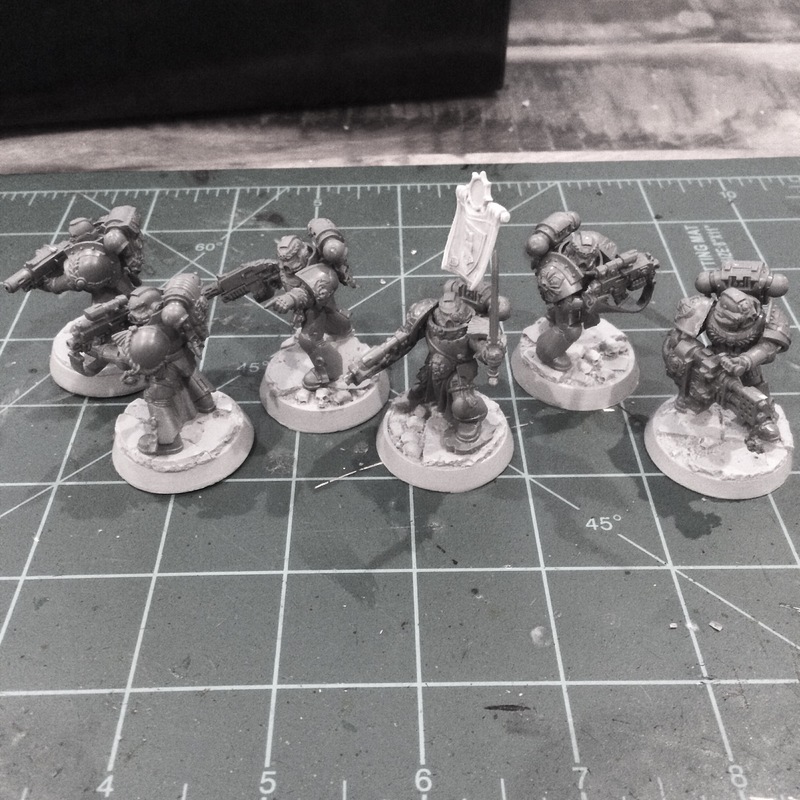 Naturally, these Imperial Fists will be part of my larger army that I’m starting. The Rhino will get tactical squad markings, as the sternguard will ultimately get a Razorback. A side-by-side comparison of stage two (Agrax shading) and stage three (Lamenters glaze). Overall, this painting method is very easy for the results it gives. You simply (1) spray the models bone white, (2) apply a 50-50 Agrax Earthshade / Lahmian Medium mix to recessed areas, (3) slather on the glaze! Once all that is done, you can edge-highlight with pure white or a preferred shade of yellow, and add a second glaze layer if you wish (optional). Given how quickly it is to accomplish steps one through three, you can knock out a whole squad in an evening with minimal effort. In retrospect, this may have been a bad idea to have so few models. I know I’ll at least be playing Orks and Tyranids..
After posting my results on my Instagram feed (@hobbyvices), I’ve gotten a lot of positive feedback. Some people say they’ve seen similar methods featured on other tutorials, so I’m sure there are better explanations out there of what I’m doing. Disfigure be easier, with my arts background – it’s just like painting with watercolor! Undercoat / base with bone white. Edge highlight with pure white or yellow (can be done before or after glaze, I prefer before). Slather on the Yellow glaze! Be sloppy, it doesn’t matter! They could use some detailing and base work, but I’d say these are game-ready!